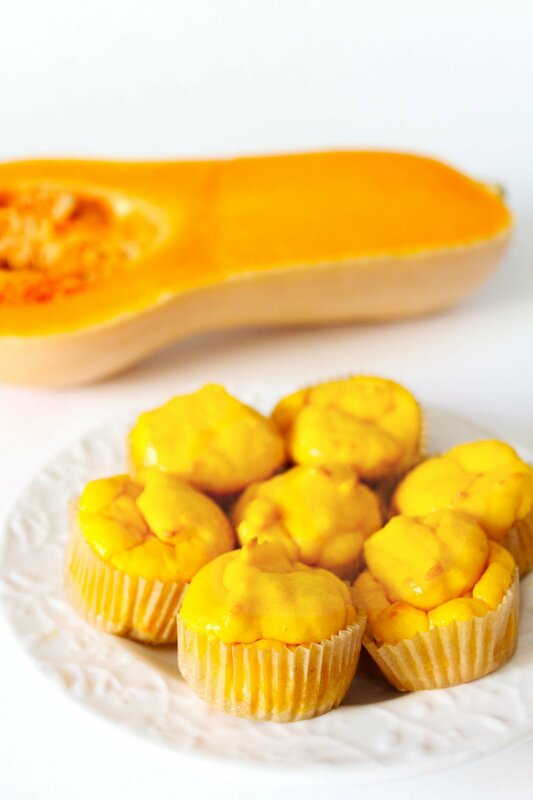 These squash muffins have been a favorite both in the Grain Free Meal Plan and the GAPS Intro Book. They are gut-healing and great to make with zucchini in the summer and winter squash in the winter. The GAPS Intro diet is a very powerful, yet restrictive and strict protocol designed by Dr. Natasha Campbell-McBride to heal the gut. We did GAPS Intro on our quest for autism recovery, and ended up healing dairy allergies and eczema in the process! The GAPS Diet is a strict elimination diet, starting with only very easy to digest low-allergen foods, and then slowly but persistently adding in more varieties of food as the digestive tract heals and the GAPS patient can tolerate them. Read everything you need to know about the GAPS Diet here. The GAPS Intro goes in ‘stages’ and my best-selling e-book What Can I Eat Now? 30 Days On the GAPS Intro Dietwalks you through the stages day-by-day. I used this protocol for my own family with amazing success, though it was a struggle to understand at first. That’s why I put together this printable ebook- to help you save time, energy, and confusion. 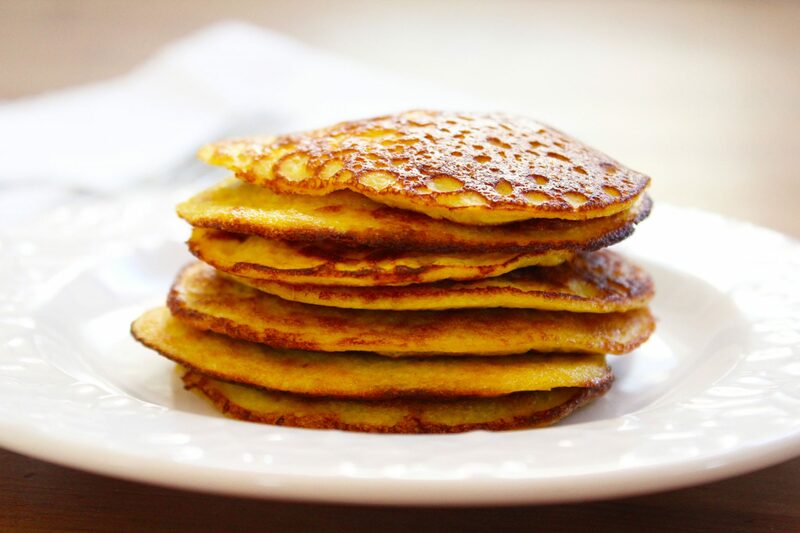 In stage 4 on day 18 we introduce these delicious pancakes, which are such a treat after 10 days of soup, boiled meat, and boiled vegetables! They can be topped with ghee to go with our numerous GAPS Intro Soups. 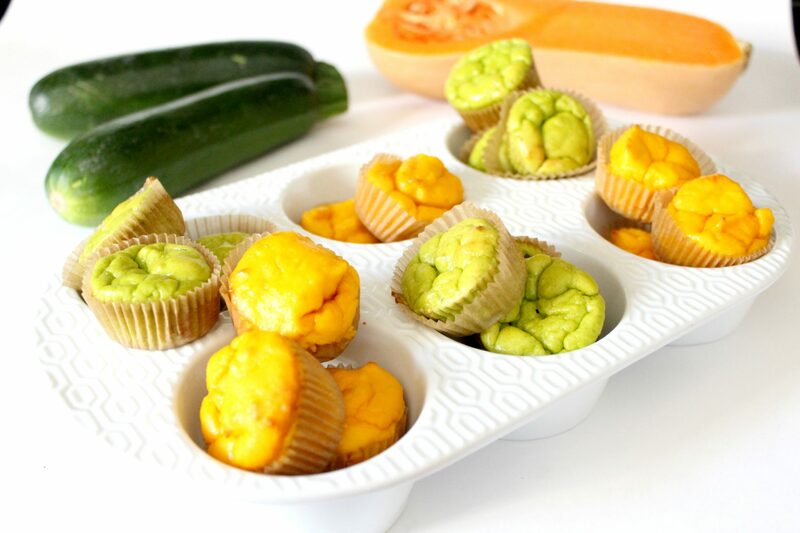 These simple almond flour muffins use zucchini to add flavor and moisture - they're always favorites on the Intro diet! Preheat oven to 350* F. If using a stoneware muffin pan, line with parchment liners and then drop a bit of tallow in each liner before pre-heating. Preheat muffin pan, liners, and bit of tallow to melt - this will prevent the muffin from sticking to the pans. If you don't want to use liners, soften the tallow a little bit and grease each muffin cup well. Puree all ingredients in a blender or food processor or shred zucchini with a grater and mix all ingredients with a fork. Pour batter into well greased muffin tins or a small loaf pan. Bake at 350* for 20-30 minutes, or until a knife inserted comes out clean. Thanks for sharing. I have a muffin recipe that I have used previously that used zucchini, carrots, raisins, bananas and cinnamon. Do you think these additions could be made to this basic recipe? Thanks! I bet you could, I’d just keep all the ‘mix ins’ to about 2 cups. What about sweetener for newbies? These look fabulous! And the fact that there is a good bit of vegetables hidden in there makes them even better. Thanks for the delicious looking and healthy recipe – I’ll be trying this one out soon! yuck why ruin it with Tallow? do u realize what u are feeding your family? otherwise the muffins seem good. what could replace eggs with? I actually do, lol. And chia seeds and pumpkin! You know that pumpkin seeds kill intestinal parasites if you eat them raw? I’m sorry, did I get gross on this post? Sorry. I had no zucchini or tallow so I just made these with yellow squash and bacon drippings. I think they needed more salt but the texture was perfect. I drizzled mine with coconut butter and honey and it turned into dessert! What’s a replacement for almond flour? We can’t do almond anything right now. Coconut flour is a good substitute. Where did you get your stoneware muffin pans? Will this eliminate the need for papers? I’d like to recommend Pampered Chef stoneware muffin pan. I did a comparison baking event, and hands down, my husband and friends chose the muffins from the stoneware. They were moist and delicious! I do not use muffin liners with my stoneware (except for cupcakes). I just brush the stoneware muffin pan with Spectrum non-hydrogenated shortening (or other healthy fat). Baking takes a little longer. Over time, all stoneware will “season”, similarly to cast iron. I’ve since converted all of my pans and sheets to PChef unglazed stoneware, all made in the USA. Is the stoneware safe? Will it leach anything bad into the food? I bet hazelnut would work Izzy. It has a very similar texture. Do you need to cook the zucchini beforehand? Can these be made into a bread as well? Great recipe! Thanks for making grain free eating so easy! I was wondering, could I use coconut flour in this recipe instead of the almond? Thanks! Coconut flour is really dense, I’m working on a CF zucchini bread but haven’t gotten one yet. If you find one i’d love to know about it! I’m a bit confused on how this recipe is allowed during the Intro Diet… I thought it was supposed to be just stews and broth… but maybe I haven’t read enough yet? Thanks! I’m on day #2 and feel soooo much better already! Wanting to know if I can do this recipe or if i should wait a bit… probably! :) Can’t wait to try it! Hi Sara – This recipe falls under GAPS Intro Stage 4 when you’re allowed to make breads with nut flour, eggs, squash, tolerated fat and salt. Thank you , for all of the work and thought you have put into this diet. I am asking for help as I do not know what to fix any more. My husband cannot eat, dairy, meats, sugars, not white flours,or white anything. He has Cancer in the lung and COPD. He will not be treated with Radiation or Chemo. At present he is treating himself with the Dr. Joanna Budwig Diet,. It is Flax seed oil, Organic low-fat 1% cottage Cheese, and Flax seed ground, with frozen fruit ground up and mixed with the cheese oil base. Also some vegetables, eggs, and bananas. There is no variety to speak of, but he does enjoy a couple slices of the rye bread at each meal. I honestly would try raw milk. Why cant he have dairy? Most people with allergies to pastuerized milk is only because its pastuerized. Try raw milk if thats allowed. Even if you have to drive far to get it. Alot of greens is the only other thing I could suggest. Even looking into the GAPS Diet to see if that could help. Good luck with everything. This might be really late, but I just recently saw this amazing website. Have you tried the Gerson Therapy. It is really different from GAPS, as in it is mainly juices, but I do know someone who had good results with that. In the past when I made zucchini bread or muffins, I’d drain in for 20 minutes or so after grating it. That’s not neccessary here? Recipe sounds great, I want to try it tomorrow, but am wondering about this one thing. I don’t have any tallow to grease the muffin tins, can I just use coconut oil or butter/ghee? Thanks! I don’t like to leave less-than-glowing comments, but I thought it might be helpful for folks deciding if they wanted to make this recipe or not. Usually we love your GAPS friendly recipes, but this one really didn’t work for us. The almond flour disappeared into the eggs, and it really just seemed like flavorless single serving zucchini omelets, not like muffins at all. I served these as a side dish with soup. No one in my family finished theirs and the rest went to the dogs (which seems like a waste of good pastured eggs, almond flour, and zucchini to me). I’d recommend adding in some herbs or spices at the very least if you want to give this recipe a try. Cara, I hope you don’t mind my suggestion. Oo! I made zucchini poppyseed muffins with quinoa/garbanzo flour the other day. Yours look better and I’ll bet they taste much better with almond flour. Has anyone tried subbing almond meal for the flour? I’m just trying to use up what I have if possible! Nope, that’s the benefit of working with summer squash! So much easier! I made these today and they were a hit with my kids. I have been slowly converting them onto a GAPS diet but freaking how I was going to provide snacks. So thank you, I’ll add this one to my recipe repetoire for kids GAPS friendly foods. I just came across your site and think it is great. I have been looking into gluten free meals a lot lately for us and our children. This will help! What is the texture of these like? Does the zucchini “disappear” or is it like shredded carrots in carrot cake?